This book is unique and very significant. It presents for the Western readers the life, teachings, activities, and interactions of a deeply realized recent acarya in a Gaudiya Vaisnava culture. We are privileged to witness through this book the guru-disciple relationship in a line of empowered acaryas, and to see a variety of expressions of guru-nistha. This is the 1st edition in pdf format. The table of contents is missing. The 2nd edition should be availalbe after Kartik 2010, so please check back. The title of this book, Arcana Dipika, means “the lamp that illuminates archana.” The term arcana signifies honour or worship. As one of the nava-laksana, the nine processes of devotional service, it refers to worshipping the Deity form of the Lord. Arcana Dipika teaches us how this service is performed and how to please the Lord through this process of worship. By the mercy of Sri Caitanya Mahaprabhu; the Six Gosvamis and other contemporary followers of Sriman Mahaprabhu; and more recently Srila A.C. Bhaktivedanta Svami Maharaja the process of Deity worship, which is the authentic method of approaching Sri Bhagavan, has been successfully introduced to the entire world. This book especially investigates the philosophy of Sri Sankaracarya, whose philosophical misinterpretations of the Vedas were so influential that not only did he succeed in driving Buddhism out of India, but what most of us now think of as Hinduism is fundamentally nothing but his brand of impersonal Mayavadism. To quote the author, â€œ…it can be safely concluded that in truth â€“ any philosophy which has the propensity to dilute, divide, and confuse the rational, logical or factual understanding of the Supreme Lordâ€™s personal form, has at some juncture been influenced by the deceptive forces of Mayavadism.â€ Furthermore, â€˜Beyond Nirvanaâ€™ demonstrates that Sankaracarya’s teachings are in the final analysis ironically nothing but a recycled form of Buddhism â€“ and in no way true to the original Vedic wisdom known as Sanatana-dharma. 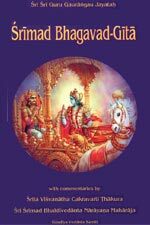 This profound translation of Srimad Bhagavad-Gita by Srila Bhaktivedanta Narayana Maharaja is sure to inspire sincere students of bhakti in their practices. It is considered complimentary to the authoritative and popular Bhagavad-Gita As It Is by Srila A.C. Bhaktivedanta Swami Maharaja. This present edition contains the Bhavanuvada of the Sarartha-Varsini-Tika (a shower of the essential meanings) of the illustrious Rasacarya, Srila Visvanatha Cakravarti Thakura, which was originally penned in Sanskrit, now in English for the first time. His commentary has been further illuminated by Srila Bhaktivedanta Narayana Maharaja’s Sarartha-Varsini Prakasika-vrtti, which guides the reader into profound aspects of the siddhanta. Consequently, the innermost intentions of the Gita are revealed to the modern audience. Some of the brilliant Rasika-ranjana commentaries by Srila Bhaktivinoda Thakura, have been included within this Prakasika-vrtti. Over 1,121 pages including comprehensive glossary and sloka index. 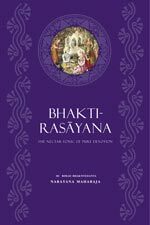 Sri Bhajana-rahasya is compiled by Srimad Bhaktivinoda Thakura Mahasaya. He has collected into the form of a book several confidential hints from his own method of bhajana to guide sincere sadhakas who are performing bhajana under his direction. Some years ago, this destitute person observed him performing bhajana. He was constantly reciting and relishing verses such as the ones in this book, thus becoming overwhelmed with bhagavat-prema. For sadhakas whose faith is on the neophyte platform, the system of arcana is provided. Many people are unable to understand the distinction between arcana and bhajana and therefore use the word bhajana to refer to arcana. One can practise bhajana by performing the nine kinds of devotion, navadha-bhakti. Because arcana is included within navadha-bhakti, it is also considered a part of bhajana. There is a difference between complete bhajana and partial bhajana. Arcana means to worship the deity with awe and reverence; that is, with knowledge of the Lord~Rs opulence and by observing etiquette. It is also arcana to serve Bhagavan with various paraphernalia according to rules and regulations and with the mundane conception of identifying oneself with the material body. In visrambha-seva, service rendered with intimacy and a sense of possessiveness, the hot rays of awe and reverence are still apparent to a small degree, but no one can refuse the excellent sweetness of its cool, pleasant moonbeams. A brief arcana-paddhati has been added as an appendix to this book. In the final chapter of Sri Brhad-bhagavatamrta, after the story of Gopa-kumara has been completed (see Going Beyond Vaikuntha), Sanatana Gosvami has quoted verses from the tenth canto of the Srimad Bhagavatam which Pariksit Maharaja spoke to his mother Uttara. They are verses of very beautiful poetry which stimulate the sentiment of bhakti. Stringing these verses together, Sanatana Gosvami has composed a necklace for the benefit of the sadhakas of this world, and when sadhakas keep these verses in their hearts, it is as if they are wearing this necklace around their necks. And if while taking Harinama they sometimes call out these verses, it will increase the ananda in their chanting. This compilation of verses is known as bhakti-rasayana, or the nectar-tonic of bhakti-rasa. â€” Srila Bhaktivedanta Narayana Maharaja. “A Drop of the Nectarian Ocean of Bhakti-rasa.” Composed by Srila Visvanatha Cakravarti Thakura and translated and commented upon by Srila Bhaktivedanta Narayana Maharaja. Srila Visvanatha Cakravarti Thakura, the crown prince of illustrious teachers among the Gaudiya Vaisnava acaryas is the author of what is considered to be one of the greatest treasures of Vaisnavas. 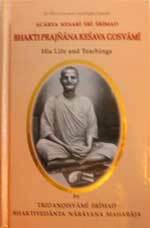 In this great book there is a description of the nature of uttama-bhakti, its divisions, saddhana-bhakti, the stages in the development of prema, the angas of bhajana, offences committed in the performance of devotional service (sevaparadha), offences against the holy name (namaparadha), vaidhi and raganuga-saddhana-bhakti, prema-bhakti, and bhakti-rasa. Srila Narayana Maharaja has written in his preface, “I have complete faith that those who are possessed of yearning for bhakti and especially the sadhakas of raganuga-bhakti who are captivated by vraja-rasa will receive this book with great reverence. Faithful persons who study this book will obtain qualification to enter into the wealth of prema of Sri Caitanya Mahaprabhu.” Over 285 pages. Composed originally in Bengali by Srila Bhaktivinoda Thakur, Bhakti-tattva-viveka is a collection of four essays. By understanding the true nature of suddha-bhakti (pure bhakti), one can relish the ultimate goal of all scriptures, the pure nectar of krsna-prema as exhibited and preached by Sri Caitanya Mahaprabhu. Translated from the Hindi edition of Srimad Bhaktivedanta Narayana Maharaja. These prayers offered at the dawn of creation by Brahma, the secondary creator of the universe, contain all the essential truths of Vaisnava philosophy. Srila Sanatana Gosvami’s Sri Brhad-bhagavatamrta occupies a special place in the realm of Vaisnava literature. It is unparalleled in its delineation of siddhanta, rasa, bhava and lila. 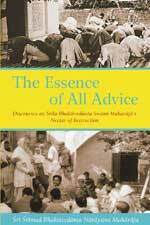 Its glories are limitless, and it is without question one of the most beneficial books for the progressive sadhaka. It is divided into two parts, and both parts tell the story of parivrajaka; that is, one who refuses the comforts of a permanent residence and constantly wanders in search of the essence of life. This incomparable narrative poem has been painted with the soft brush of Srila Visvanatha Cakravarti Thakura’s supremely sweet and natural prema-bhakti and the color of the all enchanting nectar of rasa. 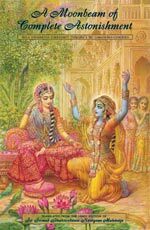 This literary composition consists of four astonishing and delightfully charming stories of the mischievous meetings of the Divine Couple, Sri Radha-Krsna. It is presented for rasika and bhavuka readers, as well as sadhakas who desire to taste vraja-rasa. Confidential Secrets of Bhajana is compiled from the lectures of Srila Bhaktivedanta Narayana Maharaja, which were given during the Karttika of 1996 in Vrindavana on the Bhajana-rahasya of Srila Bhaktivinoda Thakura. In his extensive explanation, which is replete with his personal realization, Srila Sanatana Gosvami has throughly revealed this prayer’s ability to attract Sri Damodara. During his second tour to the United States in May, 1997, our beloved Gurudeva, om visnupada paramahamsa parivrajakacarrya asottara- sata Sri Srimad Bhaktivedanta Narayana Gosvami Maharaja, delivered a series of eleven lectures in Badger, California, on Srila Rupa Gosvami’s Sri Upadesamrita as translated and commented on by His Divine Grace A.C. Bhaktivedanta Swami Prabhupada. He spoke these lectures with the aim of encouraging Srila Prabhupada’s disciples and followers to move forward in their devotional practices.